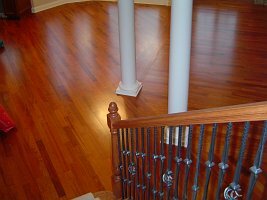 Designs Unlimited Services is a complete service, professional custom floor company specializing in new hardwood and tile flooring, existing floor restoration and wood refinishing, offering a variety of additional trim work services. Our reputation comes from over 25 years of experience working with clients such as Orren Pickell Builders, A-1 Architects, Dior Builders, Graystar Construction, Horizon retail construction, and many other top builders in Lake, McHenry, and Cook counties. We are known for providing the best quality wood and tile flooring and trim work, giving full attention to every detail. We manufacture and install our own custom hardwood floors. Hand-scraped floors or wide planks, herringbone floors, diagonals, custom designs of all types, borders and inlays using exotic feature strips, and medallions from Oshkosh are all part of the services and products we offer. Our wood floor refinishing process is unmatched. We offer a dustless hardwood floor sanding system which eliminates virtually all airborne dust, requiring minimal plastic sheet protection or prepwork. Be sure to ask us about the Bona Floor Finishing System to protect your custom flooring investment and ensure long lasting beauty. The Bona Finishing System gives your wood floor that not only a long-term "new" look, but added durability. Call us today at 847-438-9570 or 815-790-9570 and set an appointment for us to visit your home and create a beautiful living space.